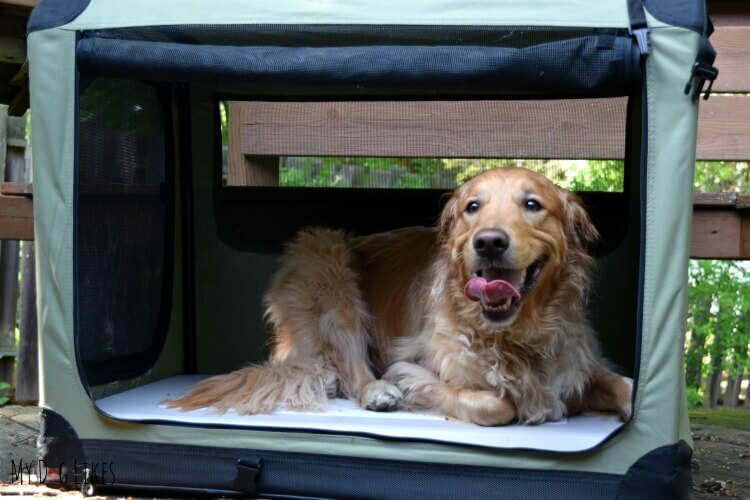 Chillspot Dog Cooling Station - A Hot Dog Solution! 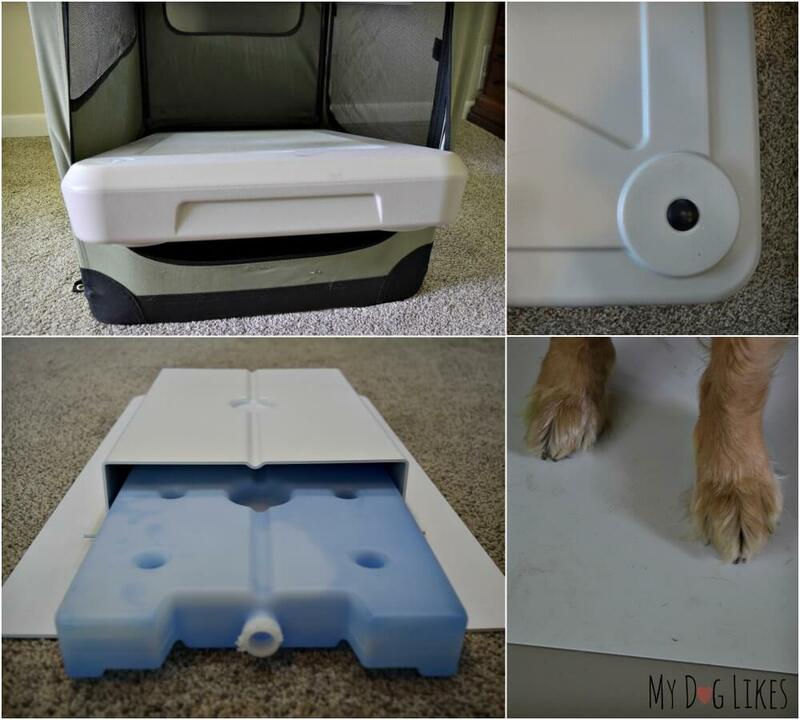 Chillspot Dog Cooling Station – A Hot Dog Solution! 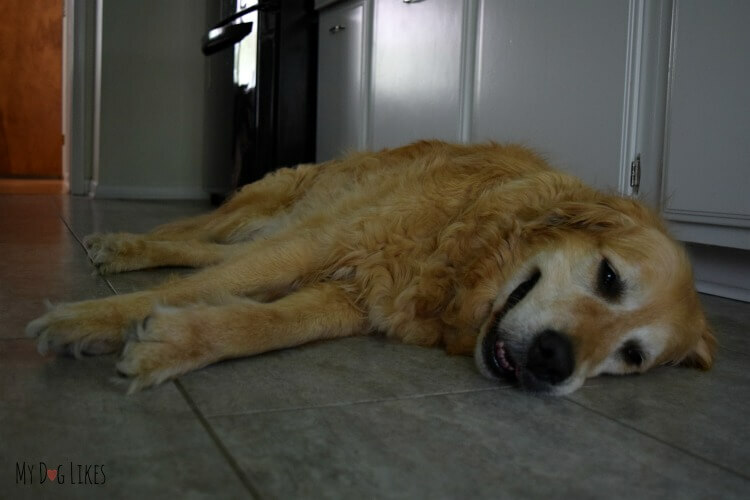 Have you ever noticed that your dog is drawn to hardwood or tile floors on hot days? Unlike carpet, hardwood and tile floors don’t hold onto heat. While these surfaces provide a bit of relief, they don’t stay cool for long, and depending on your home, may not even available. 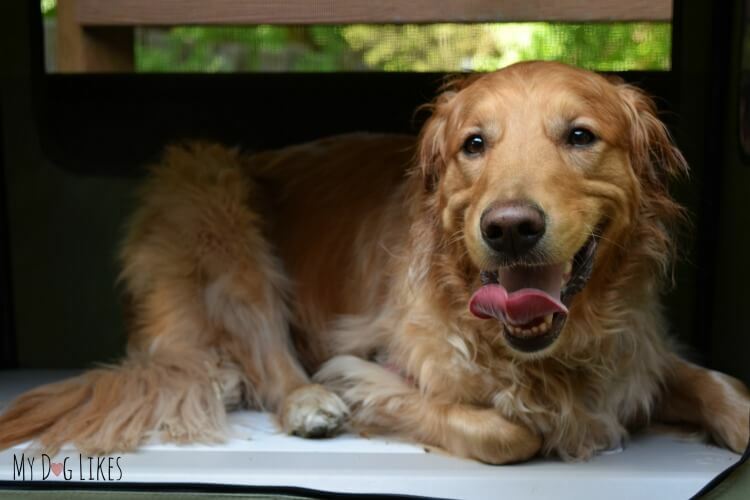 Wouldn’t it be nice to be able to offer your dog a truly cool place to rest and relax on balmy Summer days? Something that would keep him or her cool for long periods of time and keep them safe from the dangers of heat exhaustion or overheating. 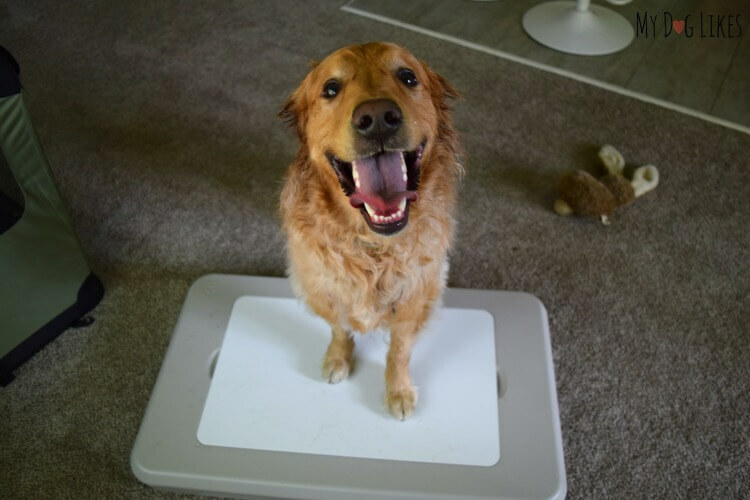 The Chillspot is a unique cooling pad made especially for dogs. Chillspot was kind enough to send a unit to test out with the Golden boys and share with our readers. Chillspot is also sponsoring a giveaway for one lucky reader (so make sure to enter below)! 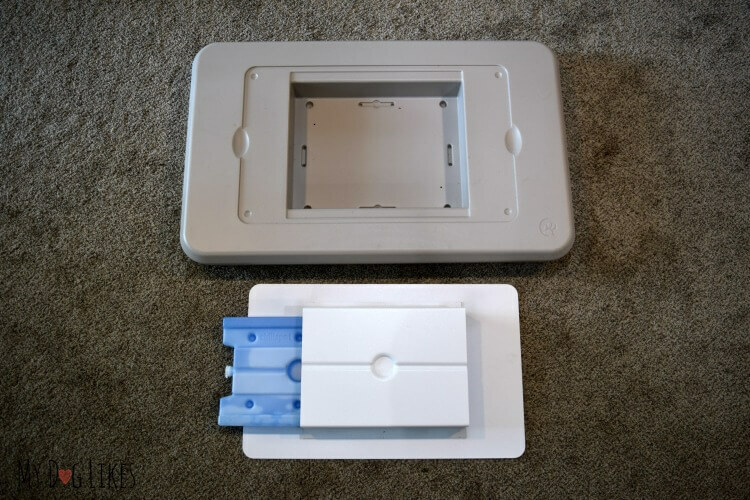 Insulated Base – The base of the unit consists of a heavy duty (but lightweight) plastic shell. This will hold the Cooling Tile in place and help it to remain cool. Cooling Tile – The cooling surface is a powder coated aluminum tile, making it extremely durable and allowing it to stay 20-30° cooler than ambient temperature for 8-10 hours! 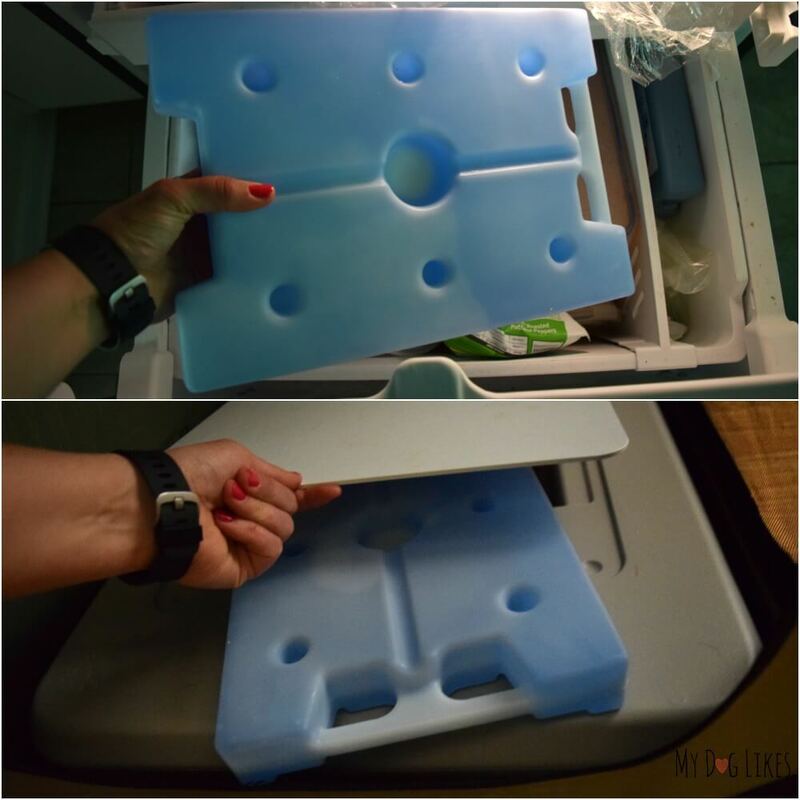 Chillpod – The source of the cooling action is a large removable freezer pack or “Chillpod.” The Chillpod slides right into the bottom of the cooling tile to provide hours of relief from heat. While the Chillpod is built to last for hundreds of heating and cooling cycles, should it ever become cracked or punctured, no worries – the contents are water based and non-toxic. The Chillspots 34.75” X 21.75” dimensions make it ideal for all but the largest of dogs. 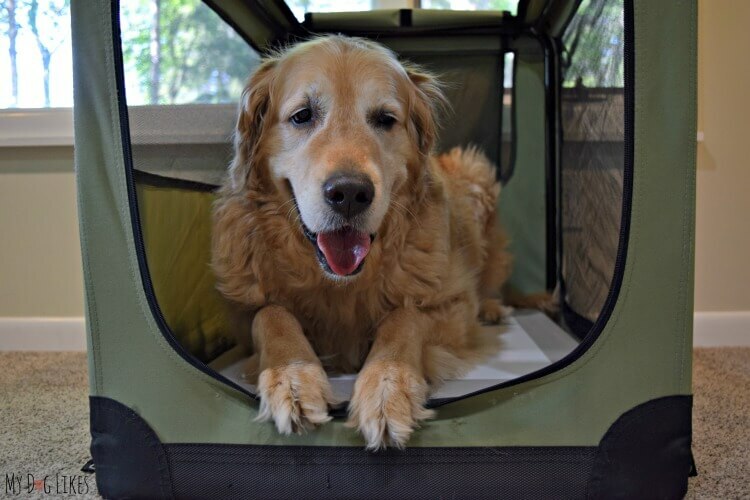 It is perfectly designed to fit into a standard size crate, allowing you to keep a crated dog cool. With a relatively thin profile of 4.5” it is not prohibitive to the space inside either. The Chillspot does not need to be plugged-in to function. Instead, it operates with a removable system of cooling packs allowing it to be used anywhere. A frozen chillpack provides 8+ hours of cooling to the Aluminum chill tile – which is also non-slip and easy to clean. This is a huge advantage to other cooling pads on the market which do not stay cool for nearly as long! As soon as you remove the Chillspot from its packaging you will notice the high quality construction and choice in materials. It is sturdily built with a very clean look that blends in nicely with any home decor. The cooling cell (Chillspot Chillpod) is large but has a low profile, making it easy to fit into any standard size freezer. It is just about the same thickness as a standard ice pack, and in our case, conveniently fit right in our side compartment or flat on top of everything else. It is best to help your dog become accustomed to the Chillspot before trying to get them to use it for its intended purpose. We put the Chillspot out on the floor of the living room for a few days (without the cooling pack) to allow them to sniff around and get used to it’s presence. After that, we used treats and a clicker to encourage the boys to first touch, then get on top, and finally, lay down on top of the Chillspot. It didn’t take our boys too long to get used to it, but please be patient. It helps a great deal if your dog has a “place” or “spot” command. Another tip is to lay down a blanket or towel over top to create somewhat of a bed for them. This should remove any hesitation they have about the surface and encourage them to snuggle in. We also found that our large dogs were more inclined to lay on the Chillspot after it was placed in our travel pop up crate. Smaller dogs would not have an issue lying on a standalone Chillspot, but our big boys were a little nervous and struggled to balance themselves and get comfortable when outside of the crate. Using the Chillspot in a crate allowed the boys to lean against the side walls and gave them the ability to flop over and feel more secure and comfortable. After introducing the boys to the Chillspot, all we had left was to wait for the weather to warm up! Last week, we decided it was time to put the Chillspot to an actual test. We froze the Chillpad overnight, inserted it into the insulated base to begin the cooling process, and were ready to go. Looking to get the boys all fired up, Charlie and I headed out on a run while Harley and Kevin took a long walk. When we returned, we encouraged the boys to have rest on top and cool themselves off. As expected, it did take a bit of convincing, but once they gave it a shot they settled and seemed to really enjoy the cooling! We were amazed at how long the Chillspot stays cool for – it really stays true to the claim of 8+ hours. The Chillspot team did a great job choosing the insulation and materials! Though we have a shady backyard, we are known to spend a significant amount of time outdoors doing yard work and decided to give it a try there as well. Using the travel crate we created a “retreat” on our deck that the boys really seemed to enjoy! With two large double coated dogs, you can imagine that the Summer temperature can get a bit uncomfortable – even here in the Northeast! The Chillspot allows us to always have a spot available for the dogs to cool down after activity! We love that the Chillspot does not require power and can be placed anywhere we want. We also love that the cooling cell is easily removable and involves nothing more than freezing it overnight. With the addition of a second Chillpod, pet parents could easily swap them in and out and keep a cool spot all night long! We are excited to have this on hand for the summer as temps start to really heat up! Whether you routinely deal with high temperatures or not, we highly recommend the Chillspot to provide a safe haven for pups after exercise and other activities. Want to try out the Chillspot for yourself? ooooh I am betting this would be amazing for our Corgis! I love that it stays cool for eight hours and doesn’t need any extra electricity etc. I like that it protects our pets and keeps them safe from the heat. I just love the whole concept. My English bulldog loves the summer months but he oven-heats so quickly and can be in danger. This would be so nice to bring out on the patio or to the cabin. Hmm, looks interesting. This would be great to try at agility trials, where keeping your dog cool and comfortable is of huge importance. Right now, I use a Hugz chilly mat and really like it. It’s soft, self cooling (no freezing required) and the dogs seem to like it. While the need to freeze this is a bit more inconvenient, and it doesn’t seem as soft and comfortable, it sounds like it might be even cooler and possibly last longer. Would love to win to give it a try. I really like that it helps keep dogs cool. I currently have three rescued Treeing Walker Coonhounds. My girl, Kyoko, doesn’t like to stay outside very long (unless I’m out with her). One of my boys, Kenji, doesn’t stay out much longer. However, the other boy, Seiji, loves laying on the driveway in all but the most extreme weather. He is a mix, too, and has a thicker, longer fur than the other two. I worry about him getting overheated when he is laying out in the sun, but he really doesn’t want to come back inside. Having something like this he can lay on to keep cool would be a good thing and I wouldn’t worry about him as much. would be nice to have the Chillspot for even traveling. I know a lady who buys bags of ice and has in her car when she travels for the dogs to lay on. My dogs lay on the ceramic tile to stay cool. I think Chillspot sounds like a great product. This would be great for my 2 dogs. Thank you! Ease of use, such a revolutionary idea. Very wonderful idea! I love that this is perfect for the hot summer days. My Rocky is extra large with thick black fur-this cool down spot would make things a little more comfortable for him this summer. I like that it is portable. I love that you can take this anywhere, so it’s useful both at home and for trips and outings. I love it easy for travel don’t require batteries and keeps cool for hours. My two lab girls would so love this they hide under a bush to get cool. I love that it doesn’t have to be plugged up or use batteries and yet stays cool for so long! I also have a very hairy dog and live in the south so staying cool is a necessity! i have 2 cold pads now and i love this one. i have the one you put water in and it is a mess. i also have the pad that you sit on and it chills you but not very well, it has that gel in it. i like that this water requires no water, just pop in the freezer and go. i have a water bowl and harness that has these with it and they are so easy to use. i also like that it stays cold for a long time. no electricty, no batteries, very nice. i think it would be great to use in the car, even with ac, the car is hot when you get in it. i like that the cool spot doesn’t require power and stays cool for 8+ hours. What s great idea. I live in Florida. My dogs would love this! So easy to use. 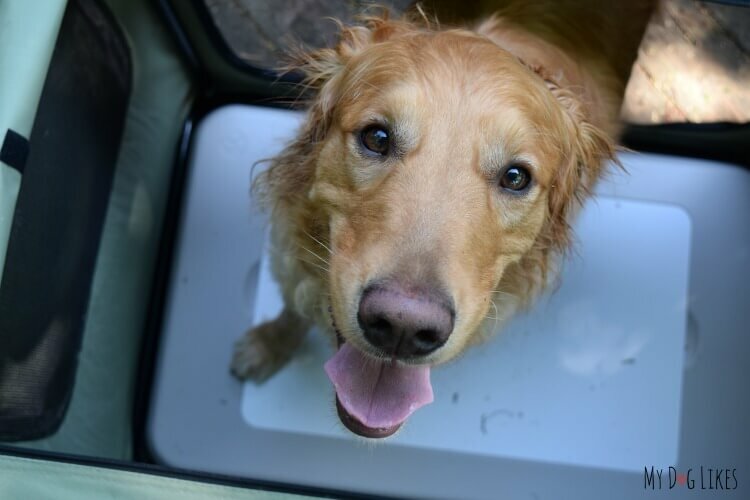 Our dog goes camping with us and fishing. This would help keep him cool. Awesome! I love the size of it. It looks like I will be able to move it while being this big because of being pregnant. I love how durable it is, that it’s non-toxic & how long it stays cool! I have a chill pad for my Golden Retreiver, but it only stays cool for about a 1/2 hour & the contents are toxic ?. This product is Awesome!!! I like the size! I have a lab, and although it doesn’t get hot very often where we live, when it does, we only have air-conditioning in certain rooms, so having a cool place would be handy. I have 4 dogs 3 of which can’t tolerate the heat. I sure could use this! What I love most about the Chillspot Cooling Station is that it lasts for over 8 hours. We’re taking our pitty mix Wadsworth on his first family vacation to the 1000 islands for a family reunion at the end of July! This cooling station would give us so much peace of mind knowing he’d have a special cool spot just for him! What I like best is the it is portable and I can take it on the boat with us or we can you it in our backyard by the pool, take it in the car with us. my dog would loveeee this! she loves to be outside but her hair is very thick so she gets hot easily. I love that you can put it anywhere and take it with you and it doesn’t require power. Coco would love it! This is awesome! I love that it will fit in a standard size crate. This would be perfect when we are at dog shows. Being able to keep the dogs cool while enjoying their day out is so important. 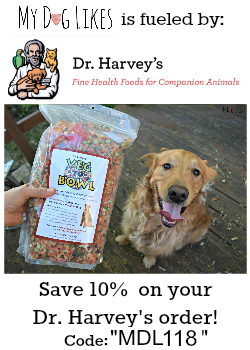 Thank you so much for the great review, I’m definitely going to spread the word about this to all my dog friends. This is a really great creation! It gets hot as Hades here in Georgia, and I feel sorry for my hound dog. She digs a spot in the dirt to keep herself cool. She would love this, and I love that it doesn’t use electricity or batteries! I like that it is portable and doesn’t require any power. I have a Boston that would love this. This would be ideal for our nose work trials in the hot weather. We would stay nice and cool in the car all day! I love how it is so easy to use. 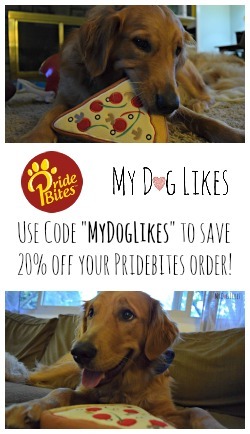 WOW, What a Fabulous Idea, I am definitely in it to Win it 🙂 Thank You My Dog Likes I LOVE this Blog!! This is a terrific product, and the best thing about it is NO batteries! I love that it easily portable and uses no electricity or water. I have a long haired cat that would love this. I love that it is low maintenance and easy to use….complicated does not cut it with my feeble brain! 🙂 Thank you. This looks like a great idea… My dog, Tack is a bully breed and overheats easily. I’ve used a cooling pad, but noticed it has ripped over the winter – so this would be fantastic to win. What I love most is how easy it is to use, And How I know my dogs would go bananas over it. I love making my fur babies happy. I like that it’s easy to wash off & doesn’t plug in. This would be absolutely fantastic for my dogs!!! I love the entire idea of it. What an awesome pawsome idea!! We live in Texas and our summers are brutal! I love that the station’s Insulated Base allows the cooling station to stay cold longer so my pups can enjoy the cool. I love that no batteries, electric or water is needed to use this. The best part is the fact that it could save your crybabies life.Thanks so very much for sharing . I love that it’s easy to use and doesn’t seem messy at all. I also love that it keeps dogs nice and comfortable. This would be so great to use in the hot summer months! Love that it would keep my dog comfortable. I love everything about the Chillspot Cooling Station!!! What a wonderful idea! My dog is part Chow so has very thick fur and he gets hot very quickly. I would love to win this!! My dog loves to be outside so I love that this would keep her cool! Florida gets WAY too hot! I love the whole concept and knowing that I could help to keep my dogs cooler during outdoor activities this summer! I love that no batteries or water are required for it to stay cool! My dog always wants to be outside no matter how hot. This would be great for him. I love that it’s not electric powered–so many heating pads/blankets required me to plug it in, and leaving that on is definitely a fire hazard! I like that you don’t need batteries or water. I love that it doesn’t need to be plugged in. It would be great to take on the boat in the summer. My dog always looks hot because wearing her life jacket is so warm! I like that it is portable. We like to go places and do things with our dogs and couldn’t go when it’s really hot. the chillspot would extend our outdoor season. It would keep dogs from getting so overheated that they pass out. Our Boxer has got overheated when walking in the summer and all most passed out. That’s scary. This is wonderful. And no batteries. I love that the ChillSpot Dog Cooling Station surface will consistently stay between 20-30 degrees below for 8+ hours outdoors and 10+ hours indoors. I like that we can take it with us and it doesn’t need to be plugged in. I also like that it’s great for the larger breeds. I love it all!! So perfect for those hot sunny summer days!! I like that it lasts 8 hours no batteries or water required so neat. I have a black lab and I think she would love this! I love that it lasts for 8+ hours! I love that it requires no water or electricity and stays cool for 8+ hours. This would be great for my dogs with really thick coats. I like that the Chillspot doesn’t need batteries or water, perfect for my Boston Terrier who gets hot easily here in Houston. I love that you don’t need batteries or water for this to work. I love that no batteries or water are required! My dog is always looking for a cool spot to lay during warm months, so I could really see him using this product quite a bit! Great idea!! They have made it so easy! Good luck to you in the giveaway! Oh gosh, Sheba would LOVE this. She gets so hot, especially at night. The only issue we’d probably have would be convincing her to leave our bed and lie on that instead. But I think once she learned that it kept her cool, she would gravitate to it. Not having to plug it in or anything is an awesome feature, since we’re usually using up all the plugs for the fans. I like the fact it is portable and there is no batteries. Love that this could keep my dog cool during the summer! I love the durability and the insulated base to help it stay cold longer. This is so cool, and I love that it’s insulated. I love it easy for travel don’t require batteries and keeps cool for hours. I like that it can keep my dog cool all day! I like that it’s so portable. I love how portable the cooling system is! I really love the entire concept of this product. What a great idea! I like that the chillspot is the perfect size to fit in a crate so not only does it keep dogs cool, it can fit in something that can keep them shaded too! The chill tile provides the relief from the heat while the Insulated base ensures the chillspot cooling station stays cool for 8+ hours. What a wonderful idea. My dogs right now love to come in the house and lay on my tile. But as you said it doesn’t stay cool for too long. Ive never thought of having them lay on cool pads. 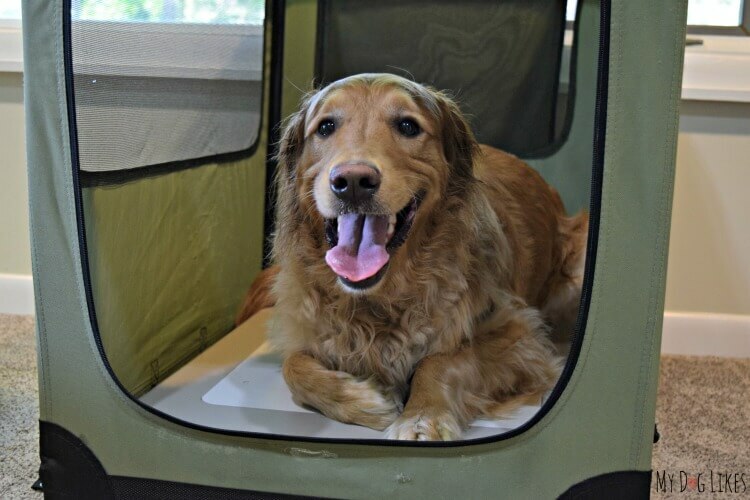 The chilling spot cooling station is just great for not only long driving trips with my fur babys, but for camping too. Which we do a lot of here, and I never leave without taking my dogs. Not only would they love this but I think I would set a trend with all our friends and other campers that brings there dogs, or even CATS too.. Oh and one more thing I LOVE how its breathable to hide out the bugs and your dog can still see, smell and breath..Thank you for sharing!! Love how it cools the pet. My dogs would love this. I love how it is not bulky and still can help keep the dogs cool. I like that it could keep my little MinPin cool after he gets himself all over heated. I would put it in his dog house. It gets very hot here in SoCal. I love that this has an insulated base, allowing the cooling station to stay cold longer. I like the non-slip surface. I worry about my old dog slipping and falling. My Pitt bull kilo would love this! I’ve been researching ways to cool him off and this is perfect! Unfortunately this giveaway is now over 🙁 If you want to order one make sure to use the code “MyDogLikes” to receive an extra Chillpod at no charge!